Not surprisingly, stocks and bonds took center stage this week. Manufacturing jobs rose by +15,000 for an average of +17,300 a month vs. the last seven years of Obama's presidency in which an average of 10,300 manufacturing jobs were added each month. November was revised downward by -36,000. December was revised upward by +12,000, for a net change of -24,000.
the average manufacturing workweek fell -0.2 hour from 40.8 hours to 40.6 hours. This is one of the 10 components of the LEI. construction jobs increased by 36,000. YoY construction jobs are up +226,000. temporary jobs increased by +1,800. the number of people unemployed for 5 weeks or less increased by +45,000 from 2,235,000 to 2,280,000. The post-recession low was set over two years ago at 2,095,000. Professional and business employment (generally higher- paying jobs) increased by +23,000 and is up +448,000 YoY. the index of aggregate hours worked in the economy rose by +0.2%. the index of aggregate payrolls rose by +0.4% . the alternate jobs number contained in the more volatile household survey increased by +409,000 jobs. This represents an increase of 2,354,000 jobs YoY vs. 2,114,000 in the establishment survey. Government jobs rose by 4,000.
the overall employment to population ratio for all ages 16 and up is unchanged at 60. m/m and is up + 0.2% YoY. This was a very mixed report. The headline jobs number was very good, but most of the internals were flat to negative, including an uptick in the underemployment rate, a decline in the manufacturing workweek, and a decline in prime age labor participation. Short term unemployment also increased slightly. And of course, wage growth for non-managerial personnel continued to be somnolent. So while we have a recent increase in employment growth, most of the other measures are either tepid or are fraying a little bit around the edges. UPDATE: I see where the main item in most other discussions in this report is "the big jump in wages! Ummm, not so fast. The "big raise" of 2.9% YoY is for ALL employees, including the bosses. The number for workers who aren't managers, as I report above, is a tepid 2.4%, right about where it has been for several years. So it workers got 2.4% YoY, but workers plus bosses got 2.9% YoY, then that means the bosses gave themselves big fat raises that have not been shared with the line workers. 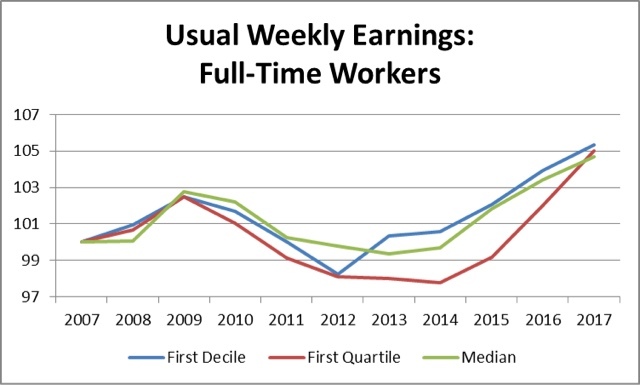 What's behind the big Q4 decline in real median weekly wages? Last week the Bureau of Labor Statistics reported that real weekly median wages declined by over 2% in the 4th quarter of last year! This is quite the anomaly in the face of generally good data that has been reported in the last few months. But I thought I would dig deeper to see why the anomaly had occurred. So I took a detailed look at each of the three qualifiers: "real," "median," and "weekly." Where did the dowturn come from? The uptick in inflation is responsible for about 1/3 of the decline in real weekly median wages. These actually increased between the 2nd and 4th quarters. So it's not that fewer hours are being worked per week. Median wages declined more than average wages. So that tells us that the main thing that probably happened had to do with the makeup of the labor force. Eureka! Professional and business hiring has remained fairly steady, even having a small bump in the second quarter. But the retail apocalypse manifested itself by outright declines in the 3rd and especially second quarters, vs. flatness in the 4th. It appears the actual outliers were those two quarters rather than the 4th quarter. The downturn in low paying retail jobs in the middle quarters of 2017 made the median 50th percentile worker someone who worked in a somewhat higher paying job. The best way to test this hypothesis is to see what happened quarter over quarter to pay for identical jobs. That is exactly what gets measured by the Employment Cost Index. If what mainly happened in the 4th quarter is that the mix of jobs in the economy changed, then the only decline we should see in the E.C.I. is that due to inflation. That report comes out next week, so we will have the answer soon enough. So the big dropoff in weekly median wages does indeed appear to be a story of a change in the mix of jobs, rather than a drop in actual pay of a job. Still, nominal wage growth in the latter part of 2017 was eclipsed by the uptick in inflation. This, by the way, adds to the evidence that the increase in consumer spending in the last few months has been driven by the wealth effect (increasing house and stock prices for the affluent and wealthy) and dipping into savings for everybody else. Suddenly I have a lot to say about the economy. My sense is that we are on to a new phase after the 2015 shallow oil-patch centered recession and 2016-17 rebound. The data has a feel to it of a late cycle blowoff. Typically after mid-cycle personal consumption expenditures outpace retail sales (10 of the 11 previous cycles, to be precise). This is so regular that it is a primary mid-cycle indicator for me. Well, as you can see, in the last 4 months, retail sales have come roaring back, even compared with PCE's. But if you cast your eyes to the left edge of the graph, you can see the tail end of the same phenomenon in 1999. Although I haven't posted the nominal (vs. inflation adjusted) numbers, the same thing happened in the late 1990s. In 1999, both retail sales and PCE's accelerated, but retail even more than PCE'S. When the stock market peaked at the beginning of 2000, both started declining rapidly, culminating in a recession 15 months later. Rapid declines in this rate tend to happen after mid-cycle. On the one hand, they are signs of economic confidence, as consumers are willing to go further out on a limb with finances. 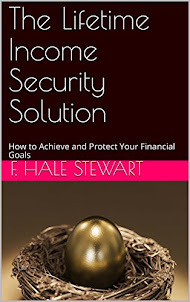 On the other hand, the lower savings rate leaves consumers vulnerable to future shocks. 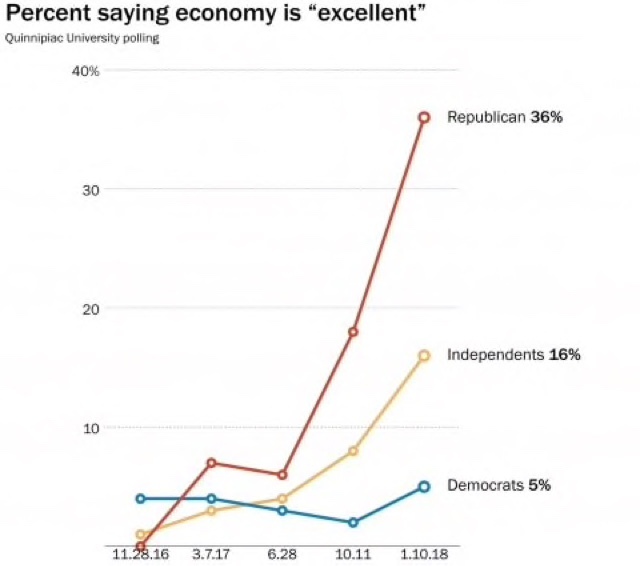 Even democrats feel a little more confident, and independents significantly more so. In 2013, the situation was reversed, where it looked like increased spending was powered by confident democrats (GOPers thought we were in the abyss). As of this morning, 2 year rates are 2.14%, and 10 year rates are above 2.70%, a nearly 4 year high. I don't profess any insight as to whether interest rates will continue to rise or not, but it is interesting that the 30 year bond has not broken out of its high one year ago. Which brings me to the point that, like gas, the cure for high interest rates is -- high interest rates. Like the 30 year bond, these have not made a new 1 year high. As of this morning, conventional 30 year mortgage rates are 4.28%, about 0.10% below their 52 week high of 4.38%. Housing stalled for several quarters last year in the face of aa 1% increase in mortgage rates, and slowed down even more in 2014 when mortgage rates rose 1.4% off their bottom. If mortgage rates hit 4.4% and stay above that level for several months, I expect another housing slowdown to begin, although given the demographic tailwind from the Millennial generation, I wouldn't expect an outright downturn in housing unless mortgage rates rise all the way to about 5%. In other words, it is probably OK to party like it was 1999. There wasn't a recession until 2001, and this blowoff isn't likely to give way to a recession in the immediate future either.